In Part 1 all the layouts were in original monthly log format with few interesting twists. Today we will see how to incorporate grid calendar in the monthly log. Do you remember what I told you in Part 1? Follow it and you will get more out of your monthly spread. The Calendar : A simple grid layout just replaces original monthly log calendar. You can use color coding to distinguish tasks in grids according to categories (like Orange for work, Pink for home and so on). The Tasks : The calendar is extended with an extra row - expense, to record expenses for the corresponding week. Tasks are divided as self, home, blog and work to avoid clutter in one single column. Similar to first part's 'Divide and Rule' layout. You can change categories according to your needs! 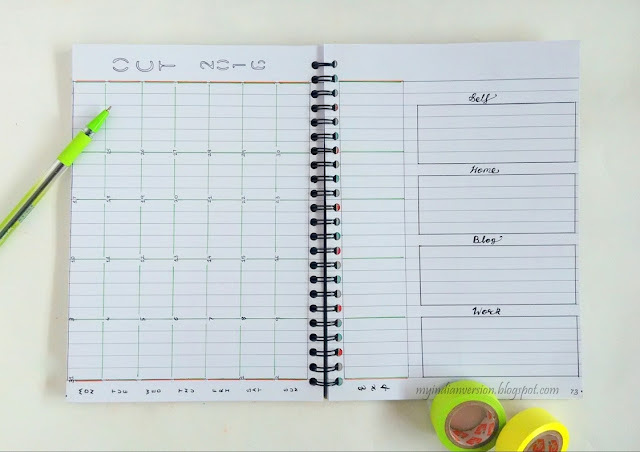 The Calendar : If you like clean grids without any lines or dots within them then this will work for you. 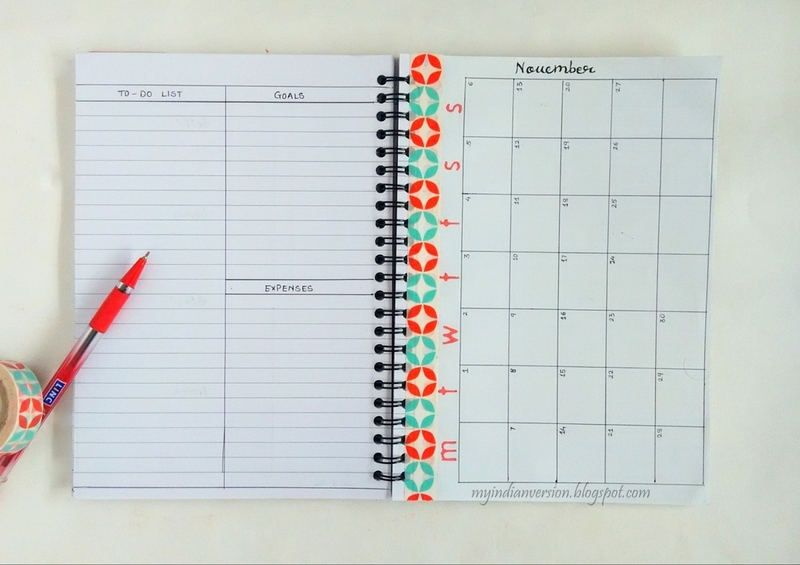 Get a print of your favorite monthly grid printable or just draw the blank calendar on plain paper. Any way you prefer. I made this layout on plain paper. Stick it on a page using washi tape (any tape can do dear!) so that it flips like other pages of the book. For a change, I decided to have the calendar on the right side of the spread! 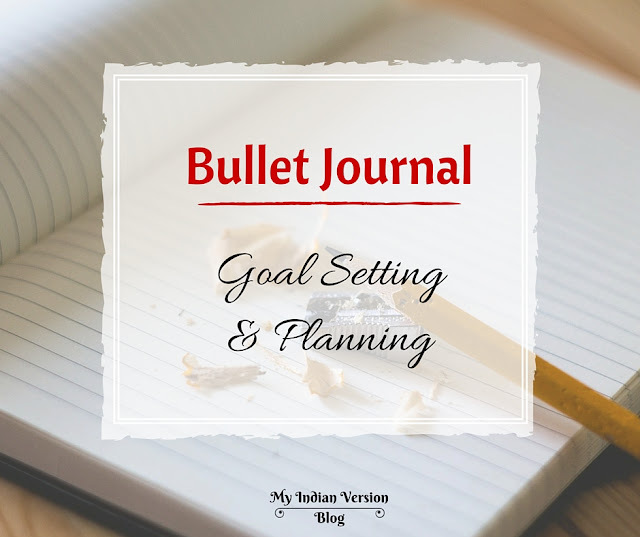 The Tasks : To make the monthly layout more fruitful I added goals along with to-do list and expenses. 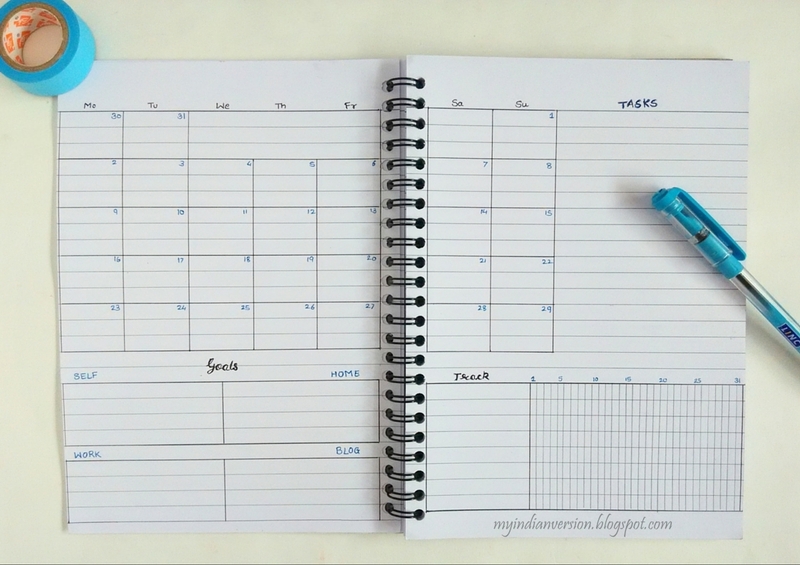 The Calendar : This is a standard horizontal monthly grid. With this format, there is more room to write. Also, you can change the size of grids according to your needs. 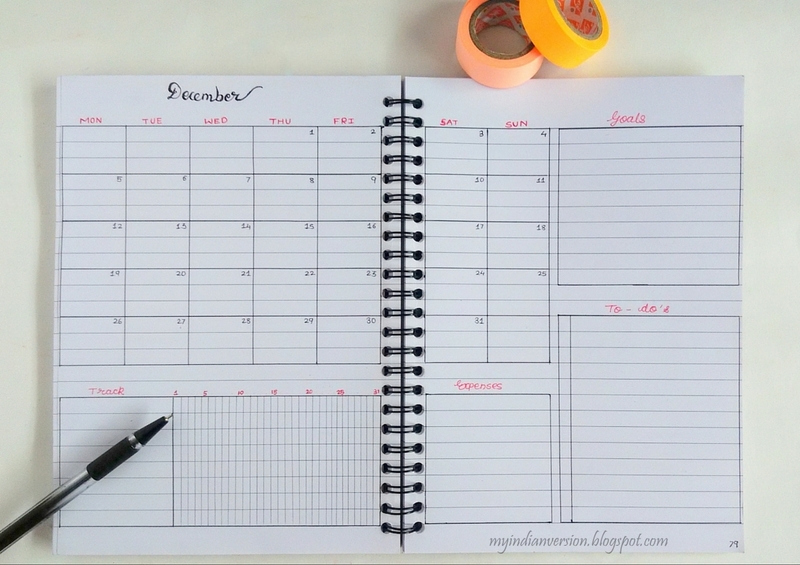 The Tasks : Along with tracking monthly tasks you can also add a monthly habit tracker in the monthly log. This is a horizontal monthly tracker. A vertical one takes more space when combined with the horizontal monthly grid. If you see closely the dates written are 1, 5, 10, 15 and so on, just to reduce the clutter on the date row. 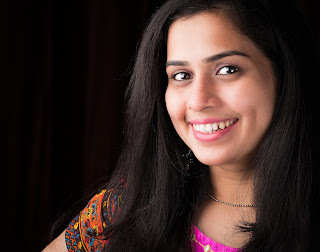 And then the spaces are allotted for goals, to-do, and expenses. The Calendar : Similar to #3 I have used horizontal monthly grid here. The Tasks : I just played around with remaining space and changed the places of goals, tasks, and tracker. 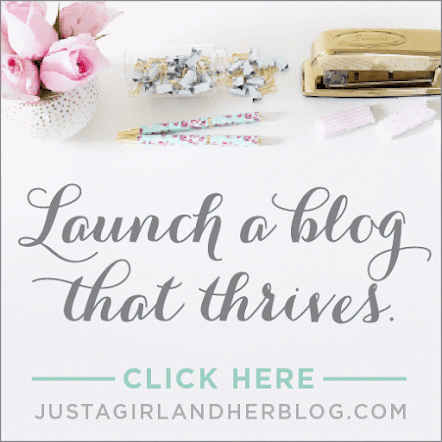 Also, goals are divided specifically into four main areas - self, home, work, and blog. Here you can label your areas of improvement! Before diving in to draw your newly inspired monthly log sit back and think for a while about your preferences and needs. 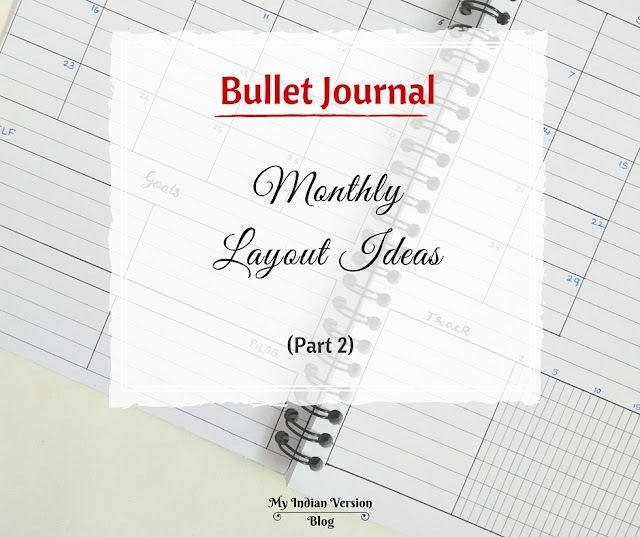 And now take your bullet journal and make your personalized monthly layout using these monthly layout ideas as inspirations. Remember, it can be simple but it should be effective, for you. Tell me in comments below your way to set up the monthly log. 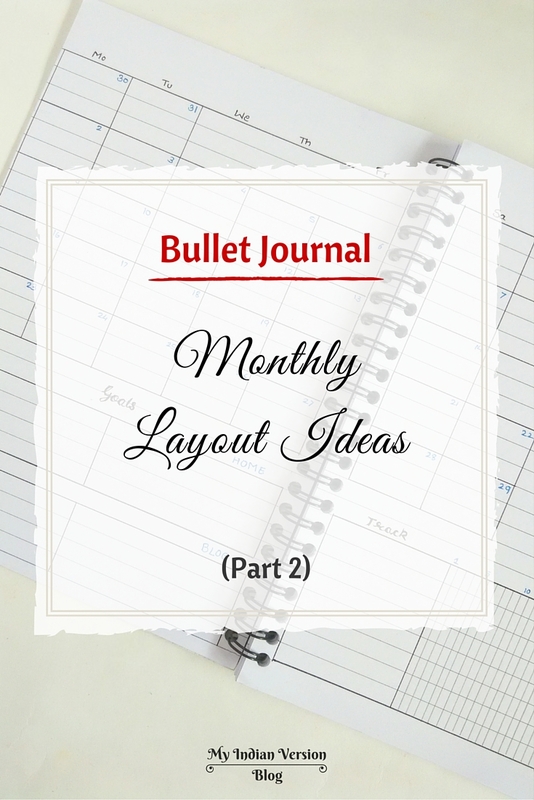 And don't forget to post your current monthly layout photos and comments on my Facebook page!